When it opens this fall, Smith Campus Center (née Holyoke Center) will provide both common spaces and calories. Food vendors on the first floor include Pavement Coffeehouse, Swissbäkers, Bon Me, Blackbird Doughnuts, Saloniki, Oggi Gourmet, and Whole Heart Provisions. Helpfully, a Pure Barre fitness center is opening at 114 Mount Auburn Street (about a donut’s walk distant), a newish building housing Harvard administrative and other offices.…To the southwest, Yale has hired Garth Ross, formerly vice president of community engagement at Washington’s Kennedy Center, to direct programming for the Schwarzman Center, its new campus and performance venue shaping up in the renovated dining Commons and Memorial Hall. Sadé Abraham, who is pursuing a master’s degree in cognitive neuroscience at the Graduate School of Education, will direct the College’s new summer orientation program aimed at entering freshmen who are the first members of their family to pursue higher education, or who come to Harvard from low-income settings or under-resourced high schools (see “Mastering the ‘Hidden Curriculum,’”  November-December 2017, page 18). The program is now named First-Year Retreat and Experience; a summary of its contents includes “navigating the transition from home to college life”: how to relate to faculty members, use office hours, and learn about campus and community resources. The Radcliffe Institute’s Schlesinger Library on the History of Women in America has acquired the archives of feminist and countercultural activist Angela Davis. The accession was organized for shipment from Oakland to Cambridge by Kenvi Phillips, the library’s inaugural curator for race and ethnicity, who joined the staff in 2016; the materials are expected to be available for scholars by 2020.…The family of the late Andrew F. Brimmer, Ph.D. ’57, LL.D. ’99, has donated his papers to Harvard Business School’s Baker Library. Brimmer is best known as a Federal Reserve governor. Selections from the papers were exhibited as part of the celebration of the fiftieth anniversary of the school’s African-American Student Union. The American Repertory Theater’s A.R.T. Institute has taken a three-year “hiatus” on admissions into its graduate training program, while it examines how it might begin to offer financial aid. Meanwhile, in an effort to encourage diversity, Brown University’s M.F.A. program for acting and directing, a collaboration with Trinity Rep, the local theater company, will cover tuition for current and future students, beginning this fall; the class size will be reduced from 15 to 10 to help make the cost manageable.…As the Hasty Pudding decided to open its casting to women (Brevia , March-April, page 23), Yale’s Whiffenpoofs and Whim ’n Rhythm, heretofore its senior male and female a cappella groups, also opened their next auditions to everyone, regardless of gender—and the Whiffs, the oldest collegiate ensemble of its kind, selected Sofia Campoamor as its first female singer. The Whiffs and Whims have also adopted a joint website, booking, and business team to promote themselves. The University’s agenda in Washington, already long, has only enlarged in recent months. President Drew Faust, who has during the past year weighed in publicly and by lobbying members of Congress on such matters as funding research (a win) and the status of undocumented students (no decision, so far), now is focusing on other fiscal matters. On March 7, she and 48 peers sent a letter to Congress objecting to the new excise tax on endowment investment income (see “Endowments, Taxed,”  March-April, page 18). (A good indication of the politics involved came in February, when Congress enacted the two-year budget; Senate majority leader Mitch McConnell inserted language exempting Berea College, in his home state of Kentucky, from the tax, on the grounds that Berea does not charge tuition.) Separately, Faust has communicated opposition to the draft bill reauthorizing the Higher Education Act, citing a multibillion-dollar reduction in federal support for financial aid. MIT Intelligence Quest, an institute-wide initiative to conduct human- and machine-intelligence research, was unveiled February 1; complementing an artificial-intelligence partnership with IBM launched last fall, MIT IQ and other programs involve more than 200 principal investigators. Brown University’s medical school has received a $50-million gift (to endow chairs, research funds, and education) from its chancellor, Samuel M. Mencoff, and his wife, Ann S. Mencoff. Samuel Mencoff is a Harvard M.B.A. (’81)—something he has in common with Paul J. Finnegan (’75, M.B.A. ’82), who is a Harvard Corporation member, University treasurer, and Mencoff’s co-founder and co-CEO of Madison Dearborn Partners, the Chicago-based private-equity firm.…William H. Miller III, an investment manager and former Johns Hopkins doctoral student in philosophy, made a $75-million gift to that department, enabling it to nearly double in size, while also supporting undergraduate through postdoctoral studies. It is the largest humanities gift in the university’s history. 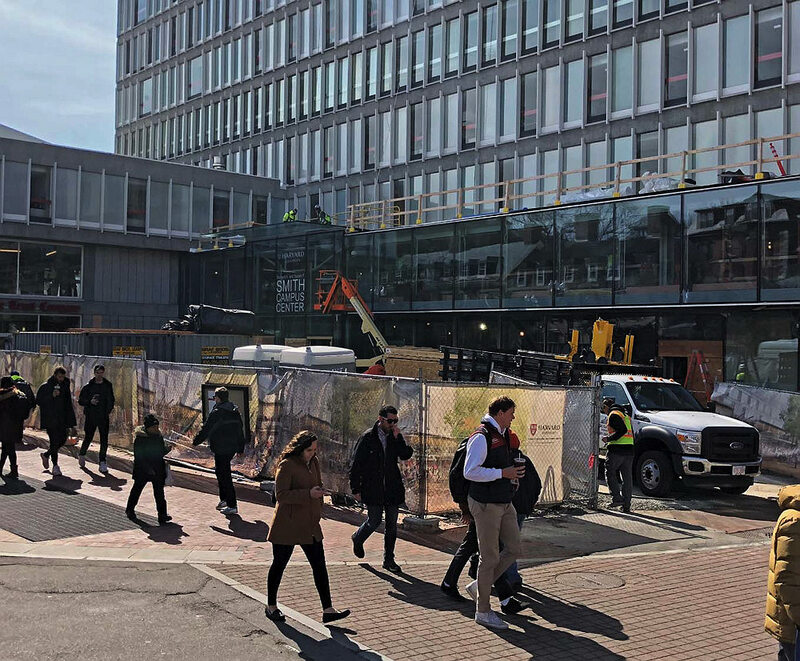 Harvard’s Allston “enterprise research campus” passed a regulatory hurdle on March 15, when the Boston Planning and Development Agency approved a master plan submitted last December . It covers 14 of 36 acres across Western Avenue from the Business School. (The 36-acre site is shown to the right, in lavender; the cross-hatched section was just reviewed.) The plan accommodates 900,000 square feet of construction plus three parking lots (shown above, with sites for two office/lab buildings, a hotel, and residences): the first stage of commercial facilities, on land leased from Harvard, to accommodate businesses that want to be near University researchers. Specific building proposals will undergo further review. Development may take some time: the site lacks roads, storm drains, and other essential infrastructure; they will be expensive for a filled site with a high water table. Sorting out what costs Harvard and third-party partners each bear, and the lease terms, may shape the phasing of development on the 22 adjacent acres, and a much larger parcel that will become accessible after the Massachusetts Turnpike viaduct is rebuilt. Online overseer voting. Although Harvard intends to move to online balloting, which might boost participation in the annual vote for Overseers and alumni association directors , the switch did not occur this year, apparently because of security and other concerns. Hope for the humanists? The latest humanities data published by the American Academy of Arts and Sciences (humanitiesindicators.org) show that engineering and STEM graduates do command higher starting salaries, but some of the gap diminishes over time—and long-term job satisfaction is roughly equivalent.…The nonscientists may face less competition: the American Historical Association reported the number of positions advertised in 2016-2017 was the smallest since the Reagan administration. But higher-education enrollment in foreign-language classes, which had decreased nearly 7 percent from 2009 to 2013, sank an additional 9 percent from 2013 through 2016, according to the Modern Language Association. SEAS Swells. Student enthusiasm for engineering jobs remains undimmed. The School of Engineering and Applied Sciences reported 1,013 undergraduates now concentrating in its disciplines—up from 943 in the prior year, continuing the uninterrupted progression from 291 in 2007-2008, the year it gained its identity as a distinct school. Computer science (451) and applied math (305) remain the dominant SEAS concentrations. Graduate enrollment has risen from 336 to 524 in the same period. Meanwhile, environmental science and engineering will become a full concentration within SEAS; faculty approval in a vote on April 3 was a mere formality, after prior, friendly debate. It will join two related concentrations: earth and planetary sciences (natural systems) and environmental science and public policy (focusing on social science and policy matters); details at harvardmag.com/fas-mtg3-18 .